The product will be delivered by email. If you have any question or want to preview some sample pages of the report, please contact us . you certify to agree with our Terms of Service. This report examines the possible barriers and difficulties for new entries into China’s Melamine Industry. Both internal risks (within the industry development) and external risks (from the surrounding environment) of the Melamine industry have been recognized and analyzed. Evaluations and forecasts have been performed for the trend of industry risk over the next five years. Accordingly, Critical Success Factors (CSFs) have been identified for new entries to overcome the main risks in order to achieve their industry establishments and market expansions. Both the Internal Risk and External Risk are classified into several risk factors which account for different weight percentages contributing to the overall industry risk…. All the risk factors are identified and measured quantitatively according to a novel numeric system. 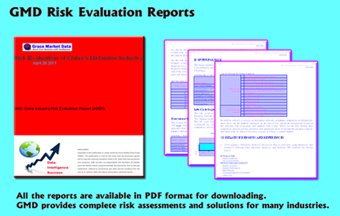 Each risk is evaluated with GMD Risk Index Number (RIN) and GMD Risk Intensity Level (RIL). GMD RIN is based on a scale of 0 (lowest extreme in theory) to 100 (highest extreme in theory) and GMD RIL is conclusive context to describe the extent of the risk (Very Low to Very High). An overall RIN and the RIL is calculated by combining each risk factor’s contribution.